I feel the same way whenever I read about some interior designer or other "lifestyle expert" saying, "I couldn't find the [glassware/carpet/fabric/chair] I wanted, so I designed it myself!" I always think, "You couldn't find that? Because I've seen it all over the place!" I know some grandmother or great-aunt of mine had glassware like that, and it's in my mind that it was depression-era. In the everything old is new again business, maybe they've started making depression-era glassware to go with the new depression era pottery dishes. 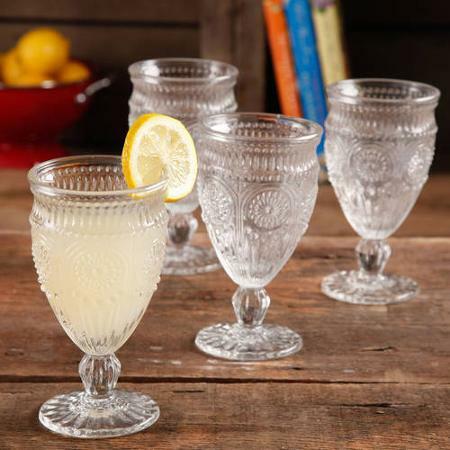 It looks like these glasses are being pumped out by some factory in Shaanxi, China, probably based on a vintage pattern. Is this your way of announcing you're going to do a giveaway of those glasses on your blog?!! Like Sarah said, "Wicky." Definitely, wicky. Oh, and Jocelyn's comment made me laugh.